Still berthed at Ocean Terminal, and lying astern of LYSTIND, the anchor handling tug EIDE WRESTLER was making final preparations to depart for Høylandsbygd in Norway. Originally named SCHNOORTURM, she was built by Elsflether Werft in Germany in 1976. In 1986, she suffered a major fire while towing two ships from the USA to Taiwan for breaking up. Despite extensive damage and being declared a Constructive Total Loss, she duly underwent a major refit, which included lengthening by 7.5 metres, giving her a new overall length of 78 metres, and a gross tonnage of 1,976 tons. 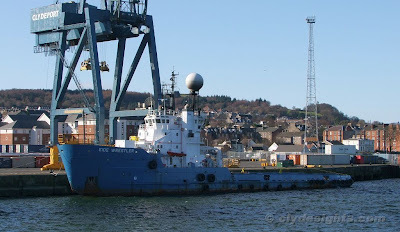 After four years named BARU, in 1991 she became SUN WRESTLER and hoisted the Red Ensign, working for Seaforth Marine at Aberdeen although owned by Eide, as she had been since 1987. In 1998, she was renamed STATESMAN following transfer of management to Hessle-based Specialist Marine Services Ltd. In 2009, she moved to the Eide fleet, and was given her current name. Her varied career is well-documented (in German) here.